Amanda M. Maples will present her paper "Urban Roots and Rural Routes: Migrating Masquerades of Freetown and Beyond" at the 7th European Conference on African Studies (ECAS) at the Centre for African Studies, University of Basel, Switzerland from June 29-July 1, 2017. Her paper forms part of the panel "Urban Artists with Rural Links." The conference is entitled "Urban Africa-Urban Africans: New Encounters of the Rural and the Urban" and the key issue is how urbanization processes in Africa transform conventional objects of African Studies and how scholars gear up to face these changes. While the urban will be prominent, the conference theme will also look into the entanglements of the rural with the urban, especially with a view to addressing an implicit assumption underlying the study of Africa and which concerns the supposed rural 'nature' of the continent as well as the constitutive nature of the tension between tradition and modernity. Later in the year, Maples will present another paper entitled "Sanse and Self-Fashioning: Gold Jewelry, Woman and Ensemble in Urban Senegal" as part of the "Art of Attire in Africa" panel at the Arts Council of the African Studies Association (ACASA) 17th Triennial Symposium on African Art. The symposium will take place at the University of Ghana's Institute for African Studies (IAS) from August 8-13, 2017. This paper forms part of her research as guest curator of an exhibition and publication at the National Museum of African Art, Smithsonian Institution in Washington, DC which opens in Spring 2018. 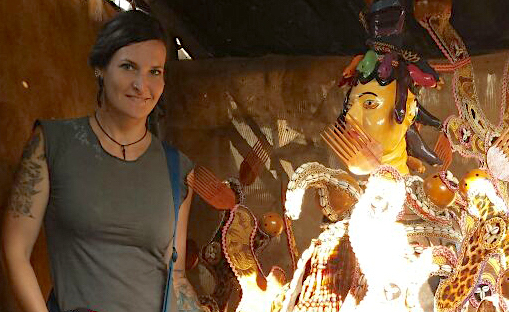 Image Caption: Amanda M. Maples with an Ordehlay mask in Lunsar, Sierra Leone.